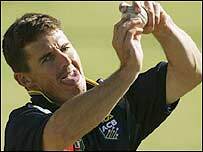 Brad Hogg was just another Australian batsman who messed around with medium pace when he first came into the game. Now, with Paul Adams out of favour in South Africa, he finds himself keeper of the most mysterious faith in cricket. 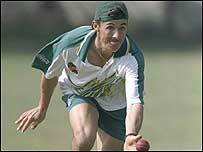 Few chinaman/googly bowlers have ever enjoyed consistent success at the top level - as Hogg found out when his first foray in international cricket in 1996 came to a premature end. After years spent honing his craft in state cricket in Australia, he has achieved probably the most vital part of wrist spin - consistency. It was in his first match for Western Australia that Hogg stumbled upon his gift for bowling chinamen. "We were playing New South Wales who had a bloke called David 'Freddie' Freedman who bowled left-arm chinamen and there I was trying to knock off Geoff Marsh and Tomy Moody's heads with bouncers," Hogg said. "Tony Mann, a leg-spinner, asked me to bowl a few chinamen for the batsman to prepare for Freedman. "He told me that they were coming out OK and it went from there." The most interesting part of the Hogg story is that he has had virtually no coaching from a left-arm wrist spinner. "I've had a bit of coaching Kerry O'Keeffe and Terry Jenner and spoken a fair amount to Shane Warne, all right arm leggies," he said. "But other than a few chats to 'Freddie' Freedman and the occasional discussion with Michael Bevan about how to bowl to different batsman, I've had hardly any specific coaching. "My stock ball, which is my leggie, is probably not my most dangerous one. I've got a couple of others which are probably more potent. He added: "When I first went to India six years ago I was probably bowling one bad ball every one or two overs. I had to cut that down to one bad ball every five to ten overs." He has developed a reputation for bowling one of the hardest googlies to pick in world cricket. "Oh, I don't know about that," he said. "There's one Englishman who can pick them OK.
"Alec Stewart actually coached me as a batsman in the mid-80s while he was in Perth. "I thought: 'This bloke is sensational'." 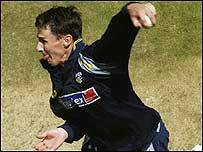 Hogg has also benefited from bowling to some of the best players of spin in the world - his own team-mates. "They generally belt me all over the park," Hogg laughed. "It's great to be able to bowl to the likes of Ricky Ponting and Darren Lehmann, who have been brought up on spin and who have got good feet. "You just try to be sly about it. Show 'em what you've got and take it from there. "It's like a game of chess." The Aussies are flying in training!